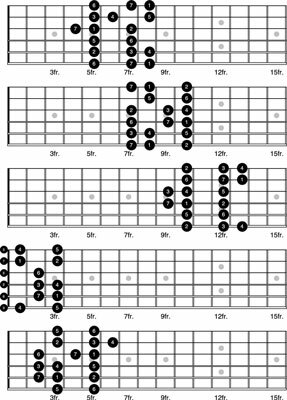 If you’re ready to move past the G major scale on the guitar, playing major scales in other keys is as simple as starting the patterns in a new position. 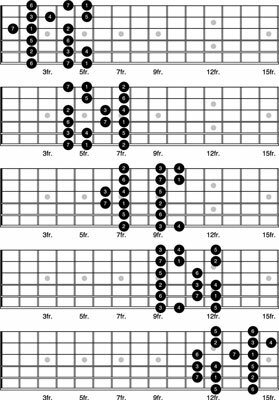 Here are all the patterns you use in G moved up two frets to the key of A. As a result, all the 1s are now A notes. You can continue to connect and play the five patterns until you either run out of fretboard or can’t reach any higher. You can continue to transpose by moving up from the key of A. For example, you can position the patterns so that 1 is As, B, C, Cs, and so on. Here is one more sample key, C. Here, all the 1s are C notes. Notice that in this key, you start high enough on the neck that you can come back and fill in the area between the open strings and the 5th fret. You can see a demonstration on how to transpose in Transposing Major Scale Patterns to C.
Practice these patterns over music that draws its chords from the C major scale (see the following list). Feel free to include songs in A minor, too, because the 6th degree, A, is the relative minor to C.
You can continue to transpose the major scale to other keys in the same way.